When I’m in a rush to make a meal, I will often make an omelette. Omelettes are quick, cheap, and healthy, and with a slice of toast or a few crackers, it’s a completely balanced meal. 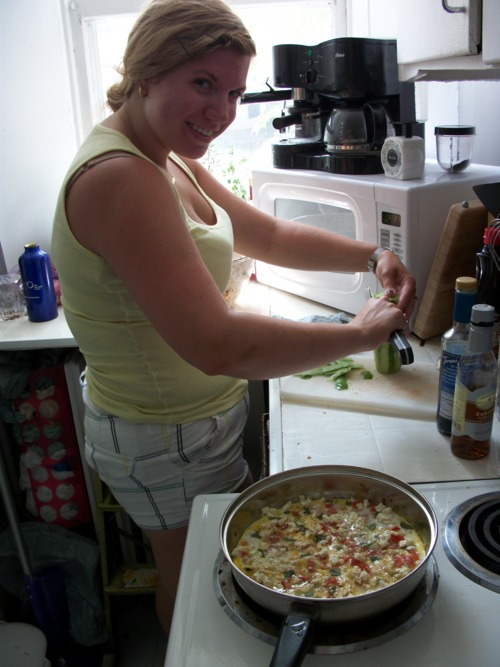 Omelettes are also a great way to use up leftover vegetables — I usually chop up whatever I have in the fridge, sprinkle some cheese and herbs on top, cover the whole thing, and finish getting ready while it finishes cooking. The secret to a perfect omelette is to cook it at the right temperature and leave it undisturbed until it’s ready. Because you’re not moving the eggs around, it takes time to cook the mixture fully through. Keeping the heat on medium-low allows the eggs to cook without burning or sticking to the pan. One of my favourite omelette combinations is a classic: tomato and feta. In the summer, when tomatoes are at their ripest and juiciest, this is to die for! Add some fresh herbs, and you’ve got yourself a little summer feast. My friend Annemarie and I had a crafting session a little while ago and stopped to make this omelette for lunch (with some cucumbers on the side). 1. In a pan, heat the olive oil on medium heat. 2. Chop the onion into small pieces and add to the olive oil. Cook for 1 to 2 minutes. 3. Chop the tomatoes and remove as many seeds as possible — this will make the omelette less watery. Add to the onions and allow the mixture to cook for a few more minutes, stirring often. 4. In a bowl, crack the eggs. We used two eggs and two egg whites for a lighter meal. If you are using egg whites, consider saving the egg yolks for other uses (apparently they are great as a hair treatment, or can be cooked and fed to dogs!). Whisk the eggs until they are well combined. 5. Reduce the heat to medium-low and make sure the vegetables are spread evenly across the bottom of the pan. Pour the egg mixture over the vegetables and sprinkle with feta cheese, fresh cracked pepper, and chopped up oregano and basil. Cover with a lid and allow to cook through. 6. With a spatula, lift the edges of the omelette all the way around the pan. Then, fold half of the omelette over, forming a half-circle (this can be tricky, so make sure you’ve lifted as much of the omelette from the pan before flipping it). 7. Serve with a piece of toast, sliced cucumbers or other vegetables, and a tall glass of water for a healthy, filling meal! The omelette part way through the cooking process. Yum! 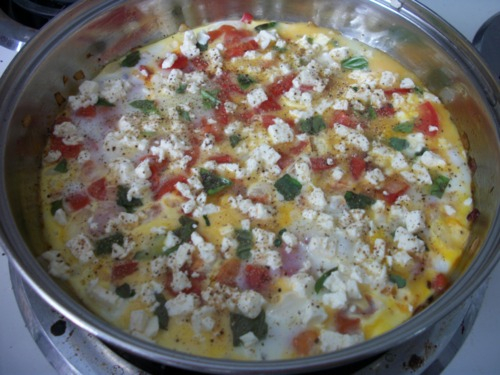 This entry was posted in Eggs, Entrées, Gluten Free, Quick Meals, Vegetarian and tagged easy, eggs, feta, lunch, omelette, quick, tomatoes by laratboulos. Bookmark the permalink.